A SIP App can be installed on iPhone and Android devices and help bring mobility to your business or even your residential phone service. In this guide you will learn why SIP applications on a smartphone can help you in your daily business life and we also list what we believe to be the best SIP Apps for iPhone and Android devices. A SIP application (also known as a SIP App) is simply an App that can be installed on to your smartphone so it can be used as a SIP client for your VoIP service. It is pretty much useless without a VoIP service but when connected to your VoIP provider it enables you to extend your business phone system to work wherever you are, whether that be the office, in the car or at home. Business Extension: It essentially acts as an extension to your business phone service. 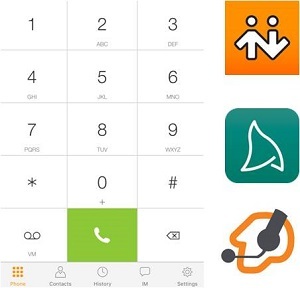 If someone rings your business phone number it can ring your desk phone and also ring your SIP App at the same time so you can take business calls on the road with you. Outbound Caller ID: If you need to make a business call simply call from inside the SIP App and the phone call will show your business Caller ID rather than your personal cellphone caller ID. This is a huge benefit to most small and medium sized businesses where employees have a personal cell phone. 3-Digit Dialing: Call a work colleague using 3 digit dialing. Simply call their extension from the App and their phone will ring. Messaging and Presence: Send messages direct to colleague's Apps or desk phones. Also detect their presence before calling e.g. are they available or busy. Video Calling: 1-click video calling with work colleagues. Reduced Battery Life: The App may reduce your battery life since it is regularly synchronizing with your VoIP provider's servers. Some of the Apps you will see below now include push notifications as a feature which fixes the battery concern since it uses "push messages" as a way to wake up the App. Cellular Data Plan: It is utilizing data from your cellphone's data plan, though if you are mainly doing audio rather than video it is not much of a data hog. Besides, most cellular plans have been 2GB and Unlimited data each month nowadays. Also, keep in mind that all of the Apps work over WiFi too which is not using cellular data bandwidth. Cellular Signal Strength: You are relying on good cellular signal strength when away from your office or home and if the signal is poor or not 4G/LTE speeds the audio quality could suffer. No Place to Hide: Yes it is true, the problem with these productivity enhancing Apps is you have nowhere left to hide! Remember you have airplane mode folks! Let's now look at some of the top SIP Apps in the marketplace. All of these SIP clients are good but we have tried to prioritize them, starting with what we believe to be the best one, the Bria Mobile App. 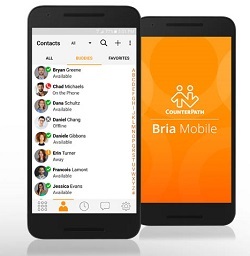 The Bria Mobile App is an award winning SIP client for both the iPhone and Android phones and tablets. There is also a soft phone available for PCs and MACs, though it is expensive. For additional information check out our Bria softphone setup example. Bria Mobile is feature rich and all features are now included as part of the subscription, such as presence, encryption, instant messaging, video and the G.729 CODEC. Regular updates for bugs and features. This is important especially considering the amount of iOS and Android software updates that occur each year. It works really well on WiFi and cellular service and switches seamlessly between them. Good online support channels direct from Counterpath, the company that designed Bria Mobile. 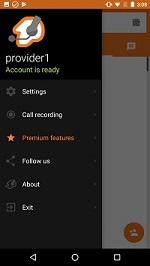 Select a VoIP provider from the App. There are hundreds of providers already populated in the App. The reason this is so important is it loads the Bria App with defaults for your VoIP service. This saves you time and potential headaches as this application has many configuration options. Bria Push notifications is a much needed new feature that SIP clients are promoting. Essentially what this does is it allows you to turn off the Bria Mobile App and when an incoming call is initiated the Bria servers will send push notifications to the App on your phone to wake it up. This feature reduces battery usage considerably and is highly recommended. When we tested this it was in Beta and still needed some work but we recommend enabling this feature once released. The cost is prohibitive for some people since it is a subscription plan. This is particularly true if you had the previous Bria version since it was a one-time cost of $7.99. However, to be fair to Counterpath, it takes a lot of resources to test each iOS and Android release and gone are the days when you could expect just one or two updates per year. Zoiper is one of the most popular SIP clients for iPhone and Android devices. In fact it has been installed over one million times according to iTunes. Pro version costs one-time fee of $4.99 in iTunes and $8.49 in the Google Play store. Free LITE version available. In-App purchases: H.264 video and G.729 CODECs available as in-App purchases. The one-time fee for the Pro version and the option to use a free LITE version is very appealing when compared to Bria. It has more or less the same feature set as Bria but at considerably less expense. The in-App purchasing makes sense since not everyone needs video or G.729 audio compression so why pay for it. Providers can white label Zoiper for their own look and feel. Pre-loaded configurations for many VoIP providers. One advantage over Bria is the QR code scanner which enables easy account configuration since you do not need to enter any account credentials, just scan the QR code given to you from your provider. The Zoiper softphone is also available for Windows, MAC and even Linux. Similar to the Bria softphone it is expensive for the premium version but for occasional use Zoiper also has a free softphone, something Bria does not have at this time. The main concern we have with Zoiper is its stability. Now to be fair, this may have been fixed in subsequent software releases but during our testing the Zoiper App froze a few times and crashed. We also had some issues with missed incoming calls with Zoiper. Often this can be NAT related but our Bria testing never failed and had the same settings. No push notification feature. No doubt this is being worked on but Zoiper is behind Bria here and this feature will save your battery life so it is important. Appears to be less software updates compared to Bria. The Acrobits App was designed by a team in the Czech Republic. It is not as popular as Zoiper and Bria but actually has an impressive feature set and at a similar price point to Zoiper. However, note there is no desktop softphone version available for PCs and MACs. In-App purchases: G.729 CODEC available as in-App purchase. Very low cost SIP client for smartphones with no subscription fee. Most features included as standard including push notifications to save battery life. If you do not use Push, you can still use the options for strong back-grounding support on iOS and Android phones. 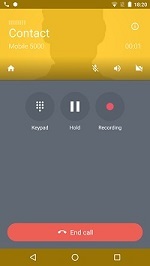 Has call recording built into the App, which can be a handy feature to have. Multiple VoIP providers have been tested with the Acrobits App though it is a much smaller set of providers than Zoiper or Bria. Regular software updates for the Acrobit App (monthly). The Acrobits App worked quite well in general though we had some issues with Bluetooth headset support. Less popular than Zoiper and Bria and considerably less downloads. Also a smaller team designing and supporting this product though they do work with some major carriers in Europe. If your business life requires you to be mobile, a SIP App could be just what you need. It allows you to take your business on the road and make and receive calls as though you were sitting at your desk using a regular desk phone. In this article we highlighted some of the benefits of using a SIP client on your smartphone and provided some great options for SIP Apps that are available for iPhone and Android devices. If you have any comments, questions or suggestions please use the comment form below.